This week I would like to introduce you to guest blogger Liz Longacre, a colleague of mine who shares some of the same passion for travel that includes volunteer opportunities. She shares some of her inspiring experiences so you can see how voluntourism can help you gain more than you give. Let’s start with the definition of “voluntourism”. Voluntourism is exactly what is sounds like, volunteering while engaging in traditional tourism activities when you travel. While that sounds so simple it’s really about so much more. It’s about cultural immersion, participation and exploration. It’s about meeting people from all over the world and from all walks of life and engaging in something truly unique with them that bonds you in a deep way. When you volunteer you get to totally immerse yourself in the culture by working, and even living, with the local people. You get to hear their stories and learn their history. You get to interact with other travelers from all over the world. You get to choose a cause you care about and then participate in it in a unique and amazing way. While you may have to do some hard work, it’s not sitting in a cubicle watching the clock tick kind of work. It’s exhilarating and unique and challenging and it’s for the benefit of those who need it most. By adding tourism activities you get to explore the country and just have fun, because you work hard and you deserve some fun!! It’s the absolute best way to get the most out of a country and out of a vacation in a short amount of time. So if you haven’t given voluntourism a try yet, here are 5 reasons why you don’t want to miss out!! 1. Cultural Immersion. The days of traveling to another country merely to sit at a hotel resort sipping mai tai’s and baking in the sun all day every day are somewhat over. From terrorist attacks, to tsunamis, to earth quakes, to economic collapses, to social media, our world has become smaller and smaller. We now want to engage more, learn more and interact more. Spending a ton of money to fly to a foreign country and never leave your resort now seems frivolous. Through voluntourism holidays you can still get your beach and mai tai time in, but you get so much more. There is no better and faster way to immerse yourself in a culture than to work side by side with it’s people for a cause you share together. 2. Dissolve Stereotypes. It comes as no surprise that people everywhere have stereotypes. Stereotypes of Americans are not always flattering. Prove people wrong. When you volunteer abroad you get to spend a lot of quality time with local people. You can show them what being an American is all about. Be helpful, gracious, courteous, respectful and eager to listen and learn. Slowly but surely you will influence people’s image of not only you but the culture you represent. 3. Knowledge is Contagious. The more you learn on your travels, the more eager you’ll be to continue that learning process when you get home and to educate others about what you’ve learned. 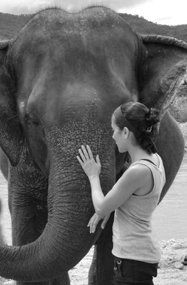 My first volunteer abroad experience was in Thailand at an elephant sanctuary. At the time I didn’t know just how harmful it was to go on elephant rides or to watch elephants paint a picture. 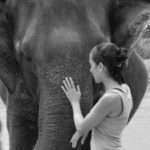 My instincts told me it wasn’t good, but I didn’t know just how devastating a life those elephants live to provide entertainment for tourists. My point is, I learned from the people working at that sanctuary and I came home and I shared that knowledge. In doing so I affected what other people participate in when they travel and that shared knowledge became invaluable. 4. It’s Good for Your Health. Volunteering has been shown to help decrease rates of depression, increase your functional ability and reduce your chances of getting heart disease! We’ve all had bouts of depression where it feels like your life is a mess, nothing’s going your way and the future looks bleak. There is nothing better at getting you out of your own head, than helping others, whether they be animals or people or the environment. You may think you have it bad but I guarantee you others have it far worse and they could use your help. In helping them, you gain a little perspective that goes a long way. 5. It May Change Your Life. It certainly changed mine. So whatever your interests may be, if you want to get a little more out of life and out of your vacation, consider including some volunteer work in your travels. You will gain way more than you give. Liz Longacre is the founder of Your Time Travels, a travel company for animal lovers. 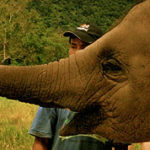 Your Time Travels offers voluntourism trips with animal welfare projects and African safaris. To learn more visit www.yourtimetravels.com.